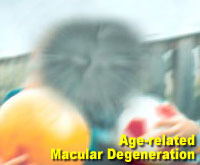 Age-related macular degeneration (AMD) is a disease that affects an individual's central vision. AMD is the most common cause of severe vision loss among people over 60. Because only the center of vision is affected, people rarely go blind from this disease. 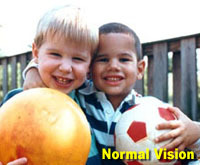 However, AMD can make it difficult to read, drive, or perform other daily activities that require fine, central vision. AMD occurs when the macula, which is located in the center of the retina and provides us with sight in the center of our field of vision, begins to degenerate. With less of the macula working, central vision–necessary for driving, reading, recognizing faces, and performing close-up work–begins to deteriorate. Dry AMD. This type of AMD is the most common. While its cause is unknown, it occurs as the light sensitive cells in the macula slowly deteriorate, generally occurring in one eye at a time. Wet AMD. This type of AMD is less common, but accounts for almost all severe vision loss caused by either type of AMD. Wet AMD occurs when new blood vessels behind the retina start to grow beneath the retina where they leak fluid and blood and can create a large blind spot in the center of the visual field. If this happens, there is a marked disturbance of vision in a short period of time. The presence of drusen, tiny yellow deposits in the retina, is one of the most common early signs of AMD. These will be visible to your doctor during an eye examination. While the presence of drusen alone does not indicate the disease, it may mean the eye is at risk for developing more severe AMD. The symptoms of AMD may resemble other eye conditions. Consult a doctor for diagnosis. Pupil dilation. The pupil is widened with eye drops to allow a close-up examination of the eye's retina. 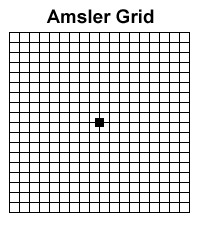 Amsler grid. 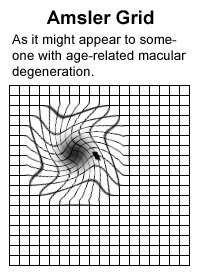 Used to detect wet AMD, this diagnostic test uses a checkerboard-like grid (reduced size shown here; normal vision on the left and vision with AMD on the right) to determine if the straight lines in the pattern appear wavy or missing to the patient. Both indications may signal the possibility of AMD. Fluorescein angiography. Used to detect wet AMD, this diagnostic test involves a special dye injected into a vein in the arm. Pictures are then taken as the dye passes through the blood vessels in the retina, helping the doctor evaluate if the blood vessels are leaking and whether or not the leaking can be treated. Gender. According to some studies, women are at greater risk than men. Age. Although AMD can occur during middle age, the risk for developing the disease increases as a person ages. Studies have shown that while people in their 50s have only a 2 percent risk of developing AMD, that rises to nearly 30 percent in people over 75. Smoking. Recent studies have shown that smoking is a major risk factor for age-related macular degeneration. Family history. People with a family history of AMD may have a higher risk of developing AMD. Obesity. Studies have indicated that obesity may be linked to the progression of AMD. High blood cholesterol levels. People with elevated blood cholesterol levels may be at higher risk for wet AMD. Treatment for wet AMD may include one type of laser surgery in which a high energy beam of light is aimed directly onto the leaking blood vessels to deter further leaking. Currently, there is no treatment for dry AMD. 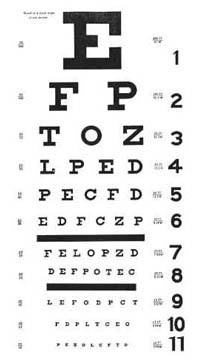 This does not, however, indicate that sight will automatically be lost, particularly if the AMD affects only one eye. Central vision may eventually be lost or diminished, but generally the rate of loss is slow.